Cockatiels, like all birds, are very adapt at concealing their illness. This is a self-preservation mechanism, as the sick and the weak are the ones predators will focus on. 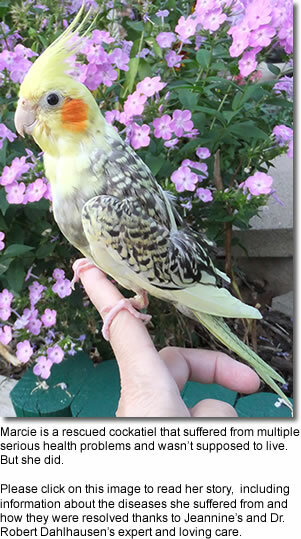 By the time your cockatiel looks ill, you can assume that your pet is seriously sick and is likely to deterioriate quickly unless appropriate treatment is provided. By observing your cockatiel daily you will learn its normal behavior and you will be able to notice anything out of the ordinary. Below is a list of things to look out for as possible indicators of disease / illness; and a vet may need to be consulted. Vitamin A and calcium deficiency are the most common deficiencies seen in seed junkies. Since seeds are higher in fat than many other foods, many seed eaters are often obese as well. Please also refer to "Calcium Metabolism in Birds". Vitamin A Deficiency: Vitamin A promotes appetite, digestion, and also increases resistance to infection and to some parasites. Please refer to "Bird Nutrition" for food items rich in Vitamin A. Overweight birds are more susceptible to arthritis and fatty liver disease. Introducing healthy foods - such as green leafy vegetables; red or orange fruits and veggies (which contain beta-carotene) - is a natural way to provide this nutrient safely. Calcium blocks should be provided also, to prevent calcium deficiency. For seed addicted birds offer sprouted seeds instead. Sprouted or germinated seeds are usually more easily accepted by "seed addicts" than fresh fruits and vegetables. Wheezing and Difficulty Breathing caused by inhaled seeds. Millet seeds are often associated with this problem- due to their small size. Foreign Body Ingestion / Lead Poisoning, exemplifying itself in any combination of symptoms, including seizures, excessive urination, vomiting and depression. Reproductive Problems, such as excessive egg-laying, egg-binding, egg-peritonitis. Wing Tumors / Xanthomas may require wing amputation. Please refer to this article about Marcie whose owner was able to reduce these tumors drastically by massaging them with Gentamicin cream and removing the cholesterol layers as they flake off.